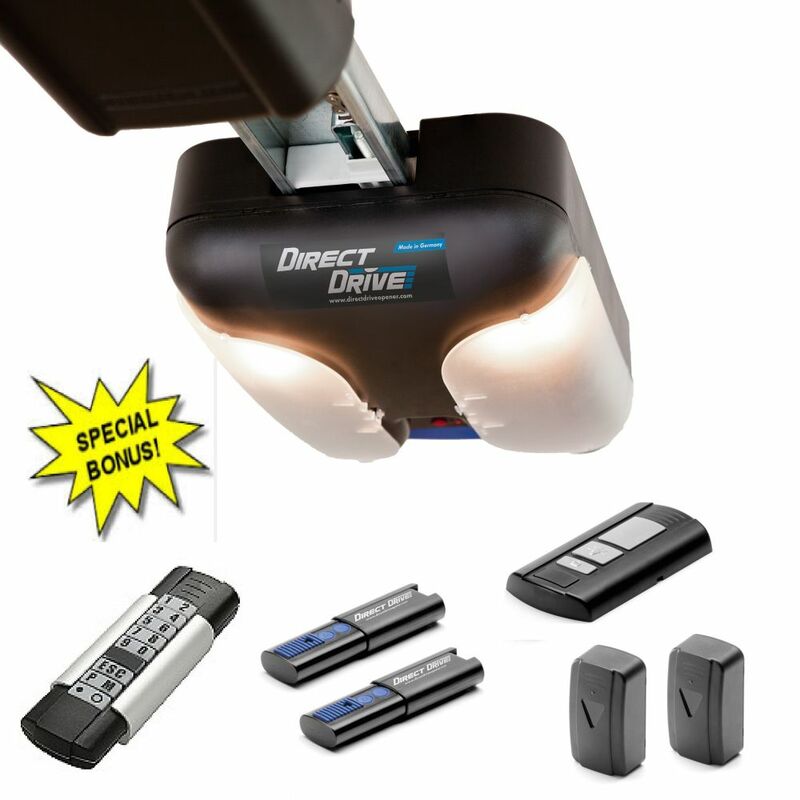 BONUS BUNDLE - Direct Drive Opener with Weatherproof Summer Keypad - Direct Drive is the quietest Garage Door Opener on the Market. Unlike conventional garage door openers that use a noisy chain, belt or screw Direct Drive has only one moving part with no moving chain or belt.The motor glides silently along the stationary chain that is embedded in an indestructible steel rail, creating the quietest garage door opener available. Provides a tight seal between your steel garage door and concrete floor with the Clopay Garage Door replacement bottom weather seal kit. This easy to install kit helps keep out items such as water, dirt, insects and pests from entering your garage. The flexible rubber even conforms to uneven floors to create that tight seal. Clopay Pro Lube for Garage Doors offers a convenient way to keep your garage door operating like new. This easy to use no drip synthetic formula provides maximum lubrication for your door. The Clopay Pro Lube is an anti-friction, anti-rust lubricant that provides a long lasting thin lubrication film on any surface. Ideal Security Garage Door Extension Springs are designed for standard 7' high garage doors. They provide additional lifting power for manual and electric garage doors.REPLACING YOUR SPRINGS If your springs sag or are longer than 25" in the relaxed position, it may be time to replace them. It's important to always change your springs in pairs to maintain proper balance, and to always install safety cables.Before buying, please watch our how-to videos to ensure you're comfortable doing the work yourself.SPRING SELECTION: CAPACITIES AND COLOURS Garage door springs are colour-coded to indicate weight capacity. Our springs follow industry-standard colour coding. You should replace your springs with the same class of spring you currently have. You can use our handy Spring Selection Guide to ensure you choose the right springs for your door. Verify your current springs before ordering and installing. Some of our competitors use blue on both their 90lb and 140lb springs! If your current springs are blue, ensure that you know your door weight or spring diameter before ordering. 550 3/4 HP Garage Door Opener with Weatherproof Keypad BONUS BUNDLE - Direct Drive Opener with Weatherproof Summer Keypad - Direct Drive is the quietest Garage Door Opener on the Market. Unlike conventional garage door openers that use a noisy chain, belt or screw Direct Drive has only one moving part with no moving chain or belt.The motor glides silently along the stationary chain that is embedded in an indestructible steel rail, creating the quietest garage door opener available.